An original letter of correspondence between brothers and business partners Sydney Octavius Chase and Joshua Coffin Chase. 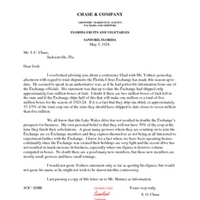 Topics discussed in the letter include Sydney Chase's conference with Mr. Yothers and the number of shipments made by the Florida Citrus Exchange that year. Chase & Company was established in 1884 by brothers Sydney Octavius Chase and Joshua Coffin Chase. The company sold insurance and later invested in storage facilities and fertilizer sales. Chase & Company was known mainly for its agricultural interests and maintained a series of citrus groves throughout Central Florida. The company was based out of Sanford and became one of the city's largest employers into the early twentieth century. Original letter from Sydney Octavius Chase to Joshua Coffin Chase, May 3, 1924: Chase Collection (MS 14), box 7, folder 14.11, Special and Area Studies Collections, George A. Smathers Libraries, University of Florida, Gainesville, Florida. Chase Collection (MS 14), box 7, folder 14.11, Special and Area Studies Collections, George A. Smathers Libraries, University of Florida, Gainesville, Florida. Florida Citrus Exchange Collection, Citrus Collection, Chase Collection, RICHES of Central Florida. I overlooked advising you about a conference I had with Mr. Yothers yesterday afternoon with regard to total shipments the Florida Citrus Exchange has made this season up to date. He seemed to speak in an authoritative was, as if he had gotten his information from one of the Exchange officials. His statement was that up to date the Exchange had shipped only approximately four million boxes of fruit. I doubt if there are two million boxes of fruit left in the state and if the Exchange ships half of this that will make one million or a total of five million boxes for the season of 1923-24. If it is a fact that they ship one-third, or approximately 33 1/3% of the total crop out of the state they should have shipped to date closer to seven million than five million. We all know that this Lake Wales drive has not resulted in double the Exshange’s prospects for business. My own personal belief is that they will not have 50% of the crop at the time they finish their solicitations. A great many growers whom they are counting on to join the Exchange are ex-Exchange members and they express themselves as not being at all interested to experiment further with the Exchange. I know for a fact where we have been operating houses continually since the Exchange was created their holdings are very light and the recent drive has not resulted in much increase in business, especially when one figures it down to volume computed in boxes. No doubt there are a good many new members, but these new members are mostly small growers and have small tonnage. I would not quote Yothers statement only so far as quoting his figures, but would not quote his name as he might not wish to be drawn intothis controversy. I am passing a copy of this letter on to Mr. Skinner as information. Chase, Sydney Octavius. 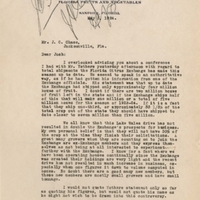 “Letter from Sydney Octavius Chase to Joshua Coffin Chase (May 3, 1924).” RICHES of Central Florida accessed April 22, 2019, https://richesmi.cah.ucf.edu/omeka/items/show/1601.